REDLANDS >> KCAL-FM (96.7) is a winner. Just ask Lamar Advertising, which recently named the Redlands-based radio station the winner of its national creative competition to incorporate inflatables onto a billboard. The station came up with the winning idea in a brainstorming session with radio personalities and staff in just under two days, said Daryl Norsell, program director and radio personality for the station. Redlands-based radio station KCAL-FM was the winner of Lamar Advertising Company's billboard competition that asked clients to come up with a winning billboard design that incorporated inflatables. “We turned this around fast,” he said. 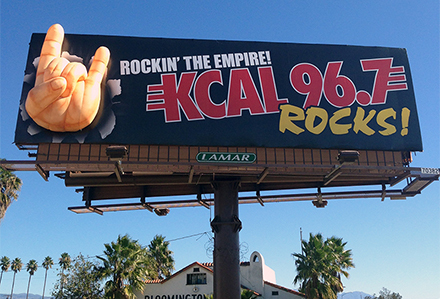 The billboard, which stands at 10 feet by 14 feet, shows the station’s slogan, “KCAL Rocks!” next to a giant inflatable hand throwing the “rock horns.” It sits off the 10 freeway just west of the Cedar Avenue exit near Bloomington. The idea for the contest was to showcase new technology to Lamar clients, said the company. KCAL-FM was immediately on the mind of Amanda Buchholz, a Lamar account executive who presented KCAL’s entry to those judging the competition. Before the winning concept was chosen, the brainstorming session had parties throwing out a number ideas from an inflatable guitar to an inflatable Ozzy Osbourne. The station settled on the “rock horns” because it signified what is commonly seen in rock shows when the crowd is pumped and ready to rock, Norsell said. “It was pretty fun, and everyone was on the same page rather quickly,” he said. The billboard will be on display through the month, but organizers of the contest have said its run could be extended. But in the meantime, fans of the station are taking notice, Norsell said. 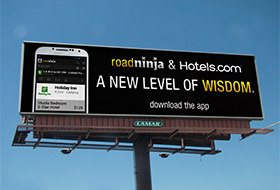 RoadNinja, one of the best travel apps that shows users what’s coming up at the next exit, today announced its hospitality partnership with Hotels.com®, a leading online accommodation booking brand. Now, in addition to helping travelers discover new places, plan road trips, connect through social media and save money with location-specific promotions, users can view hotel prices and book accommodations directly from this travel app. Lamar Advertising Company (Nasdaq: LAMR), a leading owner and operator of outdoor advertising and logo sign displays, announces the Company’s operating results for the third quarter ended September 30, 2013.